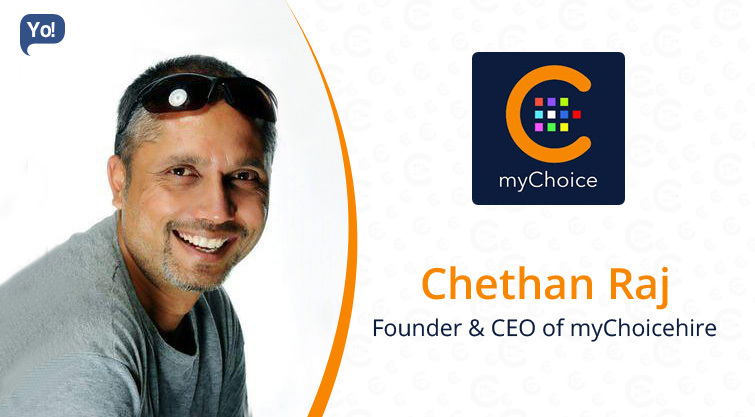 Chethan is an Ideapreneur, with an expertise in recruiting, performance management, talent management and acquisition. Being a veteran in the recruitment industry, he had always been ideating for a unique, disruptive and imaginative recruiting model. He has worked in renowned organizations and delivered leadership roles in core HR, Talent Acquisitions, Vendor Management, Staffing and Consulting area. He started his entrepreneurial stint with myChoicehire.com. His main aim behind starting this venture was to harmonize with high precision and predictive patterns, concluding to cost-saving hiring trends. myChoicehire is a mobile app built passionately by industry SME’s and prospective candidates inputs, gathering their qualified experiences of delights and disappointments over the years. A solution to any problem always lies outside the comfort zone! We took a profound analysis of the process by interviewing 100’s of stakeholders, before narrowing down to the several problem areas like Respect time, Weekend event rules, Billing hours vs. facetime, and Paperless management. Work is a part of life; Life is not a part of work! The journey started in 2011, when I moved out of a comfortable job, seeking investment from angel investors. I knocked doors of several for almost 6 months. Investors did like the idea but were not quite ready to invest in the idea. A transformational idea is probably good to hear, but extremely tough to implement as well. It fails in reality when one can’t imagine beyond boundaries. It was during early 2015, I happened to connect with Sridhar Gadhi, Chairman and MD, Paradigm Group over a conversation and briefly shared the idea – he was more than keen to help build my idea, which was inclined to his business vision! Sridhar is a first generation entrepreneur, with various business interests and avid innovator by virtue, he has incubated and scaled up 6 Start Ups in the Digital & Internet of Things space. It couldn’t have been any better to partner and start myChoicehire under Paradigm Group banner! myChoicehire – is India’s first mobile application, a unique space for recruiting process, bringing all process stakeholders on a single platform. MyChoice provides a phenomenal user experience by seamlessly connecting candidates, recruiters and hiring stakeholders, effectively transforming transactions to real-time and easy to navigate the process, all on a mobile phone. Candidates get to see event details on mobile and book interview slots at convenience; make use of one’s time effectively and plan accordingly. Candidate has the option to accept / reject / reschedule interview at his/her convenience. Check-in facility to intimate the recruitment team – that you are actually going to be present. User experience feedback – candidates get to provide feedback by end of every interview process; help organization improve their interview process meanwhile. Experience the world of social media – follow recruiter; like and comment on a given event. One can take a step further to share among other social media links and invite friends to join. Pop-up reminders / notification on the mobile screen; no more follow-up on emails received from recruiters. Inbuilt calendar to trigger reminders of upcoming interview schedules. Patience plays an important role in overcoming any challenge. I had to constantly bring in innovative models to the IP, yet wait for a worthy and significant conversation with a right investor who has the vision to see a long-term makeover. We took 7 months to build the product and now we are practically ready with necessary features required to run. We completed a couple of internal pilots for over a month to ensure everything is working as per the plan and our satisfaction. Today we are running pilots with large organizations and vendor ecosystems on ‘Freemium’model to ensure our foundations are apt for the market. Between March and April, we are providing freemium logins for selected clients, who exhibit interest to use myChoice and experience the enhanced hirification process! We are young at mind (not to ignore heart) and I believe we will remain young as a team! The entire development team is rocking at the tremendous speed of operation, who equally believes that they are working on a unique product proposition and quite excited. This team is young, dynamic, agile, passionate and dedicated to the core. Everyone participates and looks at the solution, placing themselves into a situation as end users and arrive at development. Success isn’t an easy fruit; one needs to passionately work towards the ‘purpose’. Being in a comfort zone. People are looking for early growth and success and that too without understanding the basics, which leads to disaster. Just being good at heart is not enough, unless we exhibit humbleness and honesty. Integrity has played a vital role in winning people’s confidence over the years. Currently ‘myChoicehire’ will be the focus for the next 12 months. Vision is to see ‘myChoice’ become the app of choice for recruitment by all large IT and ITES organisations in India. The recruitment process is waiting eagerly with curiosity for transformation and today myChoice has taken that purposeful leap as a change agent to start. Dream unlimited!! When it comes to career, I always had this immense attraction towards military services, IAS and IPS (not politics) – a heartfelt desire to serve the nation with an unbiased purpose.